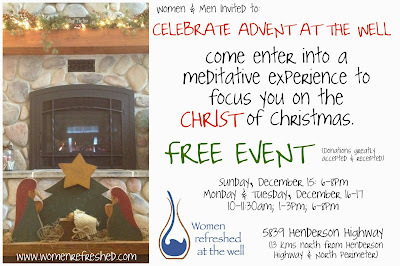 Women Refreshed at the Well: WHAT TO EXPECT if I come to CELEBRATE ADVENT AT THE WELL? WHAT TO EXPECT if I come to CELEBRATE ADVENT AT THE WELL? As I sit here this morning - I am so aware of how Advent Season has begun - and we are on our countdown to celebrating the birth of Jesus Christ. We usually celebrate with our grandkids by singing Happy Birthday to Jesus. I love how the kids get into the party mode. As I look outside, everything is blanketed with a fresh layer of snow, and the flakes continue to fall. Winter is upon us in a big way here in Manitoba. I am thankful for my daughter Ashley who put together our little advent card - and I thought that perhaps I would take a few moments in this post to tell you a little bit about what you can expect if you choose to come during one of the times stated above. I don't think I am alone when it comes to this season. There is just too much running around - gift buying, baking, gatherings, concerts, and on and on - often leaving us totally exhausted by the time the big day comes. I have often experienced this exhaustion, and have vowed that "next year it will be different" ~ and that is my hope this year. I have a feeling that you are not much different. 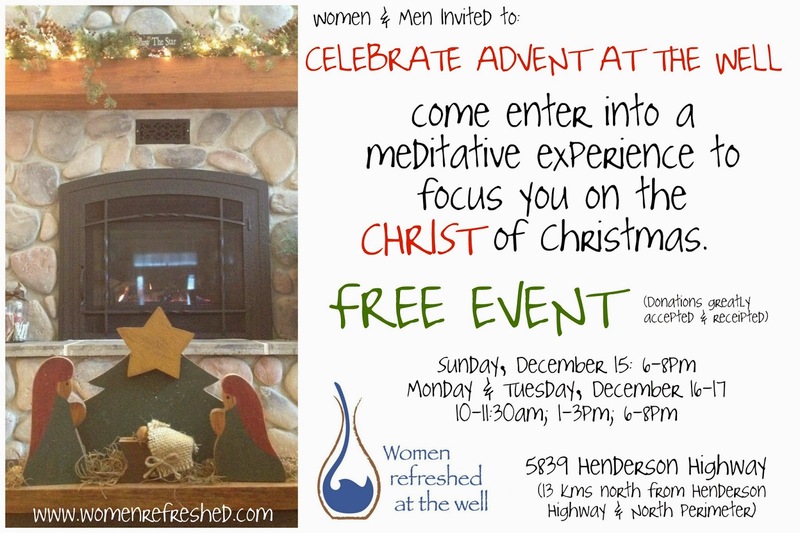 So I decided (and actually took the lead from The MARK Centre in Abbotsford) to do "Celebrate Advent at the Well" and invite you to step out of your hustle and bustle and retreat here for an hour or two, and spend some time spiritually refreshing. We will have the bedrooms set up as "stations" and beginning in the Sanctuary - you will move from room to room, and each room will have something for you to see, or do, or think about - with each station drawing you closer toward what CHRISTmas is all about. You will not spend alot of time in each room, and as you leave - someone will go into the room behind you. But it is our way of trying to help you focus on Jesus. After you are done going through the stations, you will come down stairs and enjoy some apple cider and cookies. You will set your pace - and we will provide the opportunity for you to renew. It will be a time of reflection, and we hope to keep the atmosphere quiet and peaceful in order to provide that time and space for you to reflect and pray. THERE IS NO CHARGE FOR THIS EVENT. However, we do want you to know that the ministry is a recognized non-profit ministry, with the capability to receipt donations should you wish to leave a financial gift. NOT NECESSARY but greatly appreciated if God moves you to do so. While an RSVP is not needed, feel free to call and let us know you are coming. We have chosen to include one weekend night (Sunday) and two nights during the work week, as well as some daytime time slots. We hope that you can "step out of the traffic" and come to celebrate advent here, at the Well. ps UNFORTUNATELY the stations are upstairs, and we recognize that some of you may have trouble with stairs. At some point, we hope to be able to raise the money for a lift, but right now, there are stairs to climb.